NASA’s Curiosity Mars rover autonomously selects some targets for the laser and telescopic camera of its ChemCam instrument. For example, on-board software analyzed the Navcam image at left, chose the target indicated with a yellow dot, and pointed ChemCam for laser shots and the image at right. LOS ALAMOS, N.M., July 21, 2016—New software is enabling ChemCam, the laser spectrometer on NASA’s Curiosity Mars rover, to select rock targets autonomously—the first time autonomous target selection is available for an instrument of this kind on any robotic planetary mission. Developed jointly at Los Alamos National Laboratory and the Research Institute in Astrophysics and Planetology in Toulouse, France, the ChemCam (chemistry and camera) instrument aboard Curiosity “zaps” rocks on Mars and analyzes their chemical make-up. 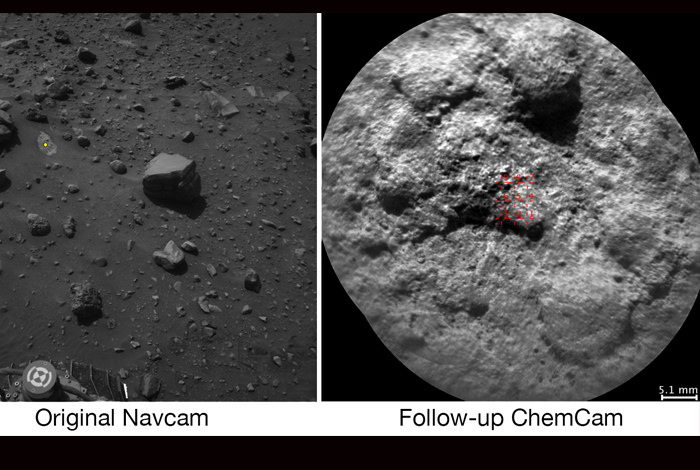 While most ChemCam targets are still selected by scientists, the rover itself now chooses multiple targets per week. The Curiosity mission is using ChemCam and other instruments on the rover as the vehicle investigates geological layers on lower Mount Sharp. The rover’s extended mission is analyzing evidence about how the environment in this part of Mars changed billions of years ago from conditions well-suited to microbial life, if any life has ever existed on Mars, to dry, inhospitable conditions. For more information about Curiosity, visit: http://mars.jpl.nasa.gov/msl.